Heat ghee add wheat rava and keep stirring till golden brown. Heat 3 cups of water in another pan. When water starts boiling add the broken wheat. Reduce flame and cook till wheat is almost done. Now add sugar and elachi powder and walnuts, raisins and cook till ghee separates. Let it cool. Add milk just before serving and heat for 5 minutes on low flame. Serve hot. Mix all the ingredients together and knead into soft dough using very little water if required. Knead dough till smooth. Make 10 bolls out of it. 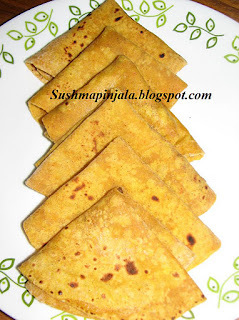 Using rolling pin roll out each portion as chapatis. 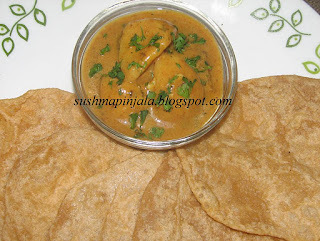 Cook each chapati/ thepla onboth sides on tava adding very little oil. Serve hot with any chutney or curry or u can eat them as it is. Heat oil and add onions, grated garlic and saute till onions turn golden brown. Now add chopped tomato, sweet corn, peas, red chilli powder, coriander powder, salt and sugar. Saute for 3 minutes and switch off the flame and let it cool. 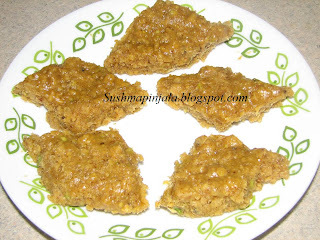 Make the khakhra's to 2 inch pieces and place on a serving plate. I have used store bought Khakhra's here. 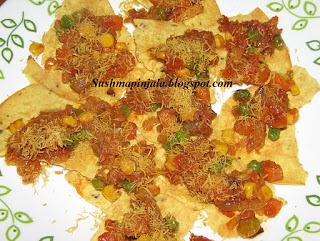 Top the khakhra's with the tomato and veggi mixture and garnish with chaat masala, chopped cilantro and sev. Serve immediately. Peel the skin of baby potatos and cut them to half or leave them as they are. On medium heat fry potatos tilll they are 3/4 cooked Remove and keep aside. In the same oil add cumin and crushed garlic and fry till golden brown. Now mix besan and stir for 5 minutes. Also add coriander powder, garam masala, chilli powder and haldi. Switch off the stove and mix yogurt and 1 cup water. Now add fried potato's and cook on low flame untill potato's are completely cooked. Garnish with chopped cilantro and serve hot with rice, roti or poori. 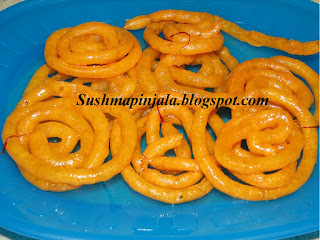 On the 2 nd day of BM #9 am here with yummy sweet called Magaj. Its noting but besan burfi. Very simple and delicious. Made this for the first time and it turned out very good. Mix besan with 1/2 of the ghee. Keep aside for 20 mits. Sift it through a sieve. 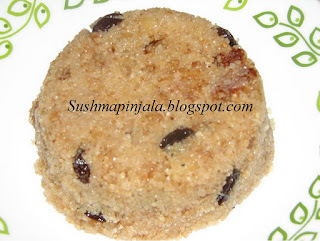 In a kadhai warm rest of ghee and add flour and fry till golden brown stirring continously. 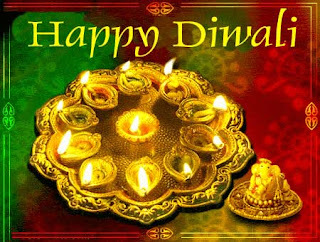 Add Khoya or ricotta cheese set on low flame and mix well Make sugar syrup of 1/3 consistancy add this to fried flour and mix well. Now add almond and pista mix well. When its warm add sugar syrup mix well and pour the mixture on greased flat plate or tray. When warm cut them to a square or diamond shaped pieces and set aside to cool. That's it besan burfi or magaj are ready. Mix besan, salt, soda, ajwain, 1sp oil together in a bowl. Add water and knead into soft dough. Take a small portion of dough and place it on a greased surface and with base of your palm flattern the dough and cut long strips out of it. Deep fry them over medium heat untill crisp and let them cool. 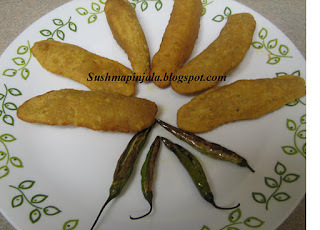 Fafda is ready to serve with spicy chutney or fried green chillies.